For the past year and a half I’ve been working in the space of container technologies. My career trajectory in retrospect seems obvious, going from working on Debian and Ubuntu, to my first pure open source job in OpenStack, and now working on DC/OS. I realize now that I keep moving up in the stack as each layer becomes more of a commodity. 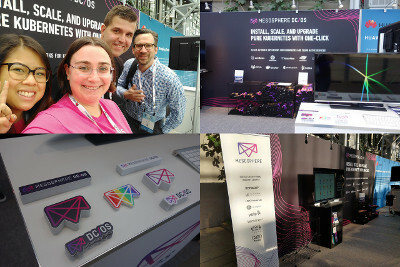 Kubernetes was fairly new when I started my role at Mesosphere, but in the past year and a half it, and the community surrounding it, has grown tremendously. In September, we even launched an offering of Kubernetes as another scheduler in DC/OS. But what’s even more fun for me is how many people have accompanied me on this journey. At this event I ran into several people who I’ve worked with in open source spaces for years. Sometimes it’s people I see at a lot of conferences, other times it was people I worked directly with. In the selfie image collage below, I got pictures with Jorge and Daniel who I worked on Ubuntu with when they were at Canonical, and Andreas who has spent over a decade at SUSE and worked with me on the OpenStack Infrastructure team. We’re all now working at companies or in roles that are related to containers. 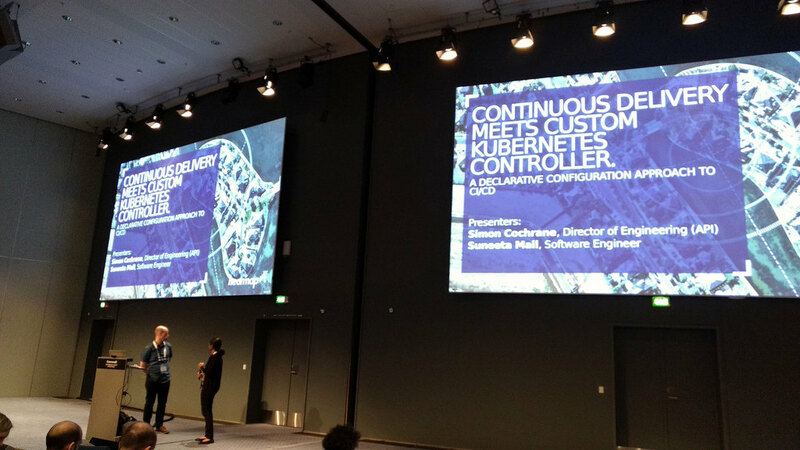 This is how I ended up in Copenhagen a few weeks ago for KubeCon + CloudNativeCon Europe 2018. The Cloud Native Computing Foundation doesn’t just host Kubernetes, they have many projects under their umbrella, so there was also a strong showing from projects like Prometheus and I saw talks on Fluentd and Linkerd. Plus, for the first time in a while, I wasn’t speaking during the conference. That allowed me to focus on going to sessions and spending time at the booth to help with some of the more technical questions. My other focus was more on the systems administration toolkit side, as I attended talks about Prometheus. I like metrics and monitoring, but now that I’m out of operations in my day to day work it’s not something I’m heavily involved with. I’d like to change that, so I was eager to see what things people were doing with metrics and monitoring in Prometheus. First, during one of the keynotes I learned that they had rewritten a lot in the 2.0 release to make everything faster, so it could scale better, there is a blog post from the Prometheus team detailing that here. Second, people are doing cool things with the metrics being collected by it, I wrote about it in Exploring Prometheus at KubeCon: Not Just Metrics. Essentially it’s starting to be used as part of the highly-available, self-healing microservices infrastructures supported by containers. As someone who has spent a fair number of late nights fixing production systems during her career, it’s exciting to see the tooling coalesce like this to improve the lives of people managing these complex systems. Even better, many companies are also leading the way in efforts to open source some of this tooling so others in the ecosystem can benefit from it. Stepping back and looking at the event as a whole, I was struck by the hype cycle that Kubernetes is going through and how eerily similar it is to what I experienced in OpenStack. The event is growing fast, there are a lot of proof of concepts out there and some key players using it in production and being showcased. Major tech companies are right there to support the CNCF and events around the conference itself. Even the conference party held at Tivoli Gardens was a pretty amazing occurrence, and not something I’d typically expect from an open source conference to throw for all participants. My boss wrote about this some in KubeCon 2018: Looking Back and Forward where he echoed many of my own feelings around lessons that the Linux and OpenStack communities have learned. It’s definitely an exciting time to be part of the container ecosystem, something echoed in my experience with the OpenStack Summit in Vancouver last week. The last thing I wanted to note came from our new friends at Microsoft. After decades of tearing down open source software, they’ve changed their tune in recent years. Throughout the company from leadership to engineering the change to embrace of open source is very real, and I now know several solid open source people who work there. That didn’t quite prepare me for the Microsoft keynote though. The presenter got on stage, plugged in his laptop, and we saw the distinctive aardvark wallpaper from Ubuntu 17.10. 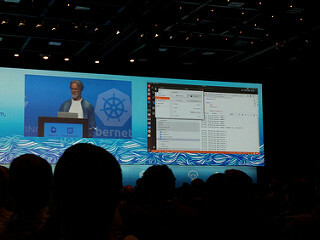 In a sea of presentations on Macs, it was the keynote speaker from Microsoft who went on stage to present a demo on Ubuntu Linux. I was so thrilled. This entry was posted on Saturday, May 26th, 2018 at 1:09 pm and is filed under events, tech, travel. You can follow any responses to this entry through the RSS 2.0 feed. Both comments and pings are currently closed.